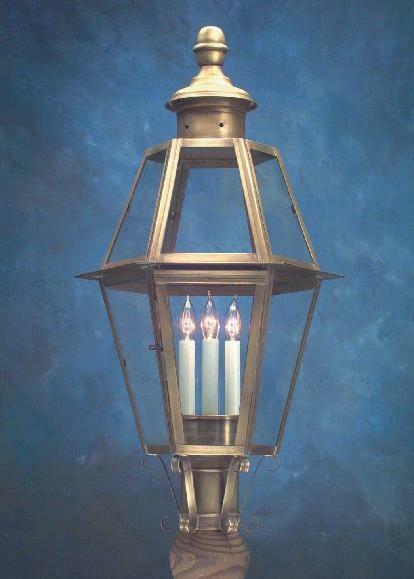 In order to properly illuminate sidewalks & driveways, our New England style colonial post lanterns should be placed no closer than 3 feet away from the area to be lit. Post lanterns create a “dark spot” directly under and around the post. The spot is roughly three feet in diameter, sometimes even larger. Placing your New England style post lantern too close will not provide proper illumination. Hammerworks Colonial Style Post Light Small Coach P105A is a scaled down version of our New England Style Colonial Post Lantern Large Coach P105. Especially relevant it has all of the same features as the larger model. Therefore either size features the unique 6 sides as well as the attractive 3 candle cluster light configuration. Of course as always you can choose from antique copper, antique brass, verdigris copper or painted black finish options. In addition for a minimal up charge we offer clear seeded glass as an alternative to the standard clear glass. Just as with the Colonial Boston Post Lantern P103 and the Colonial Post Lantern Small Sturbridge P102 we provide 2 size options to choose from. Most importantly no matter which size or style you prefer our Colonial Style Post Lanterns are made with a 3 ” post collar. Therefore you can easily pair it with any of our Colonial Style Light Poles. If you have a stone pillar perhaps you will choose to mount it with the Scroll Base for Post Lanterns. If you want something less elaborate the simple Stone Pier Mounting Base is ideal. Either way you can’t go wrong! As you can see options abound. No matter which Reproduction Colonial Post Lanterns you prefer, you will always receive exceptional quality and craftsmanship from Hammerworks. If you want a more formal style take a look at the Olde English Tudor Lighting. While the English Street Post Lantern 920P is exquisite, the Old English Manor House Copper Post Lantern 922P is equally impressive. Each of these styles are also available in 2 sizes. In addition we offer the coordinating English Style Wall Light 920W and English Manor House Wall Lights 922W. In addition you can round out the collection with the English Manor Copper Hanging Lights 922H. 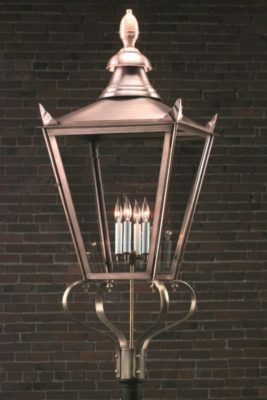 Most noteworthy, all of the fixtures within the Olde English Tudor Lighting collection are made in antique copper only.